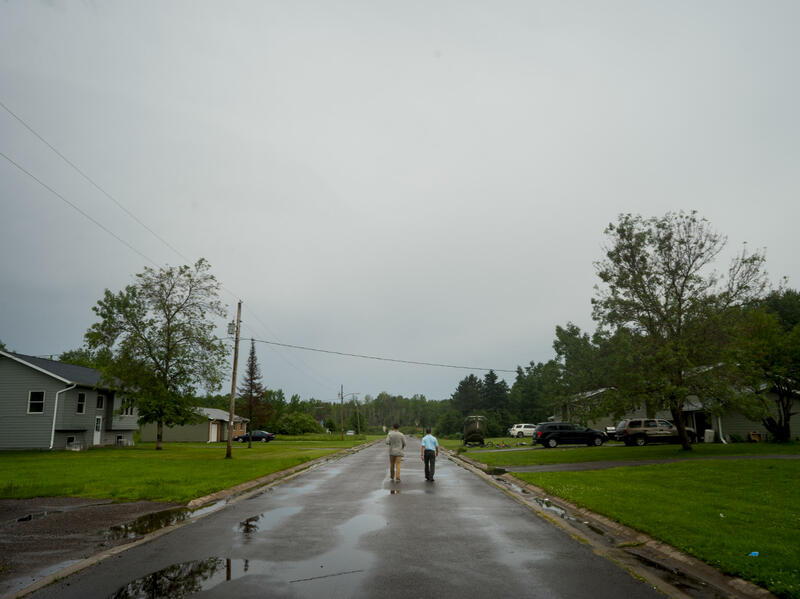 James Rees, left, and Nicholas Pinter of the University of California, Davis, gather housing data in the town of Odanah, Wis. 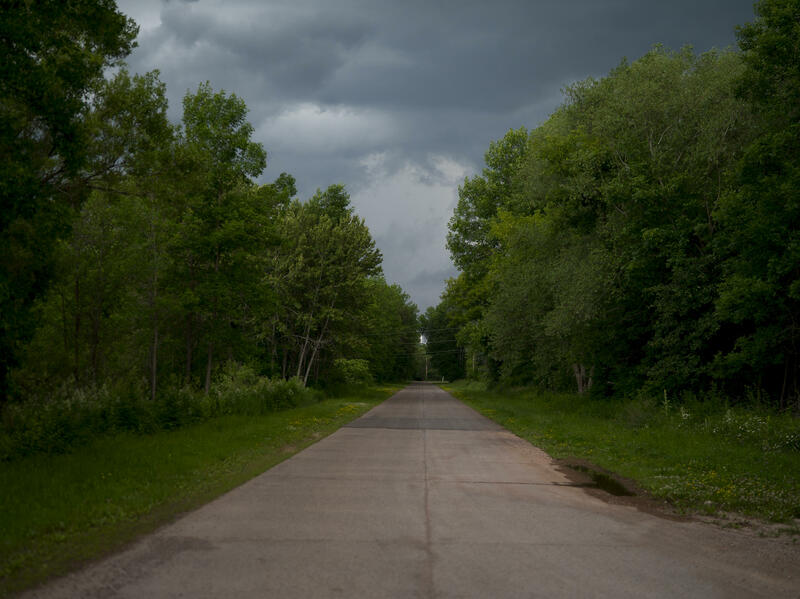 This road was lined with homes before the town of Odanah, Wis. moved to higher ground. 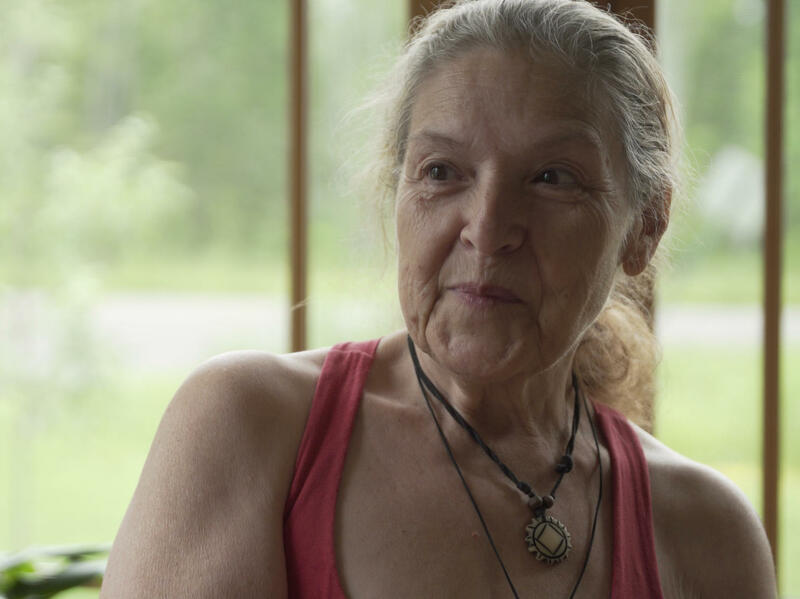 Star Ames lives on the Bad River Reservation in northern Wisconsin. Her father was the longtime tribal chairman for the Bad River Band of the Lake Superior Chippewa Tribe, and helped instigate the relocation of the town of Odanah. Mike LaGrew explains where people lived along the banks of the Bad River in Old Odanah. Scientists trying to understand and quantify the effects of the town's move are using everything from hand-drawn maps to satellite images in their analysis. Edith Leoso, the historian for the Bad River Band of the Lake Superior Chippewa Tribe, explains the area's flood history to Nicholas Pinter of the University of California, Davis. Odanah was home to thousands of members of the Bad River Band of the Lake Superior Chippewa Tribe, and, as the water rose, people were trapped. "My dad went house to house in a boat and evacuated people," Star remembers, "taking people out through their second story windows." Ames' father, Donald, was the tribal chairman at the time. "What I remember the most about [the flood] was my father was really frustrated that they couldn't move," says Ames. "He wanted to move the village." After the big flood in 1960, Ames set out to move thousands of Odanah residents to higher ground. In 1963, the Bad River Housing Authority was established and a couple years later the first displaced families moved into new houses — some of them federally subsidized single-family homes, most of them duplex rentals — a few miles up the highway. It was the beginning of a monumental shift in life on the reservation. In the three decades or so after the 1960 flood, waves of people moved out of the flood plain until virtually the entire town had relocated to higher ground. The timing could hardly have been better. At the same time that Odanah was moving, climate change was beginning to affect the region, increasing the risk of catastrophic floods. In the end, and largely by accident, Odanah became an early example of one of the most controversial options for a community trying to cope with climate change: retreating altogether. Nicholas Pinter first heard about Odanah a few year ago, and immediately wondered why he hadn't heard about it before. Pinter, a geologist at the University of California, Davis, studies floods — where they happen and how humans deal with them. He's particularly interested in places where repeated, severe floods have forced entire towns to move. So-called managed retreat is a hot topic as climate change drives global sea level rise and more frequent and severe rainstorms in many parts of the country. It's perhaps the most drastic of the many ways a town can deal with flooding. Upgrading drainage systems, raising buildings and building sea walls don't require people to leave their homes. Nonetheless, for some communities, complete relocation appears to be the best option. "The U.S. is, right now, spending tens of millions and may in the future be spending hundreds of millions of dollars on managed treat, on community relocation," says Pinter. "They should be looking to the lessons of history." Pinter is studying multiple towns, hoping to provide some of those historical lessons about how and why towns move out of harm's way. Some places have already gotten attention for relocating, such as Valmeyer, Ill., which moved after a huge Mississippi River flood in 1993, and Staten Island's Oakwood Beach, which retreated after Hurricane Sandy. "Odanah was the great unknown relocation," Pinter says. The town wasn't moving because of climate change, per se, but as people moved out of the flood plain, rainstorms were getting more frequent and severe. There have been multiple major floods in the region in recent years, culminating in a 2016 deluge that led the governor of Wisconsin to declare a state of emergency. "In a way, Odanah was very successfully moved right before the monster flood, the 2016 flood, came through. That saved many hundreds of structures from potential flood damage," says Pinter. But exactly how many buildings were saved is more difficult to calculate. Pinter and James Rees, a student at the University of California, Davis, are combining old maps with satellite data and laborious in-person counting to figure out the answer. "It takes a lot of work, but we'll be able to estimate how much damage would have occurred in 2016 if this town hadn't moved before that flood happened," explains Rees. The team hopes that putting hard numbers to damage avoided will be helpful for governments in other places that are trying to make similar decisions, weighing the costs of moving against the potential for future catastrophe. Long-term risks are notoriously difficult for local governments to plan for, and this is especially true for disasters like floods, which have a low likelihood of happening in any given year. For that reason, moving out of the flood plain before the big flood is almost unheard of, which is what makes Odanah exciting. "I don't want to tell them what their narrative is, but from an outside perspective, you had a relocation very well-timed," says Pinter. "It's usually right after a major flood. Here the real monster, in terms of quantity of water, came through after the relocation." But that's not how it feels to some people on the Bad River Reservation. This is not the first time the people of Bad River have had to move. In fact, the tribe's existence in Wisconsin is itself the result of a relocation. Odanah's original spot in the flood plain was chosen, as the oral history goes, by Ojibwe people from Maine. Driven west by invading Europeans, they eventually found a place where food grew on water. The food was wild rice and the water was the Bad River, where it flows into Lake Superior. In 1854, the Bad River Band signed a treaty with the federal government to control about 125,000 acres of land, with Odanah at its heart. People still bring up the move, and the treaty, in conversation today. And there was another, more recent relocation, also demanded by the federal government. In 1956, Congress passed what was known as the Indian Relocation Act, with the goal of cutting off support for American Indian tribes. The act created incentives for people living on reservations to move away from their allotted land and into cities. "They gave them a bus ticket, an apartment. Who wouldn't want that?" explains tribal historian Edith Leoso. Her own mother moved to Chicago in that period, around the same time that Odanah was beginning to relocate. Many people who moved as a result of the Indian Relocation Act describe feeling displaced. In some parts of the country, entire tribes collapsed as the federal government ordered tribal governments to dissolve, and it became financially impossible for families to stay on their land. This is the context in which Odanah began moving after the flood of the 1960. "I am a product of relocation," says Leoso. When she thinks about the town's move out of the flood plain and onto higher ground, she sees the latest example of federal government interference. "It's just being forced to move," says Leoso. "It was a forced relocation, essentially. It wasn't something that we wanted to do. And that's something we've been forced to do all along." Pinter says the side-by-side economic success and apparent cultural failure of the Odanah relocation is a wake-up call for federal and local governments. Native communities are disproportionately affected by climate-related flooding, in part because of that very same history of pushing Native peoples onto marginal land. Right now, the federal government is working on plans to move Native American towns in Alaska, Louisiana and elsewhere. Even if those moves go smoothly from a technical standpoint, Odanah shows how they could potentially bring up a painful past. 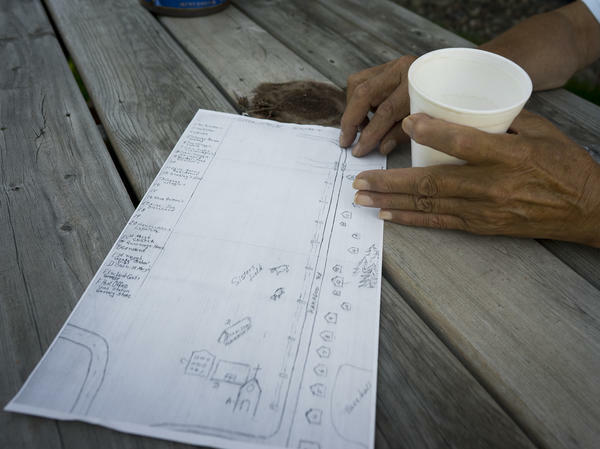 "You know, you can draw a plan for a new town on the back of a napkin. That doesn't mean it's going to be a functional blueprint for a place that people can live in," says Pinter. "One of the things we've learned is that there are unique challenges in a Native American community, and, given that some of the headline relocation sites are Native American communities right now, they absolutely should be visiting Odanah and talking to the people here." Now to the story of residents of a flooded town who had to pick up and move. That decision has caught the attention of scientists concerned with climate change. NPR's Rebecca Hersher reports. REBECCA HERSHER, BYLINE: Lunch has just wrapped up at the Bad River Elder Center in northern Wisconsin. HERSHER: Can I ask how old you are? AMES: (Laughter) I'm old enough to remember the flood. HERSHER: The flood was in 1960. Star was in elementary school. AMES: Every place that we thought was high enough, the water kept coming up. The streets in the village were underwater. And my dad went from house to house in a boat. HERSHER: In photos, people are hanging out of second-story windows. After that flood, Star's dad, who was the tribal chairman at the time, wanted to move the entire town to higher ground. He got the federal government to build some rental houses a few miles away. Initially it was meant to be temporary to help people whose homes had been destroyed. AMES: Then everyone was real excited because the families that seriously needed places to rent were finally going to get them. We didn't have anyplace else here for them to live. HERSHER: But over the next three decades, more and more people left the village. Climate change started to cause more frequent and severe storms. The village became Old Odanah, and the higher ground was called New Odanah. Today basically the entire town has moved. And that has caught the eye of a scientist. NICHOLAS PINTER: Well, this was a voyage of discovery for us. Odanah was the great unknown relocation. HERSHER: Nicholas Pinter studies how and why people move after big floods. And Odanah is a pretty interesting example because what happened here - floods chasing a whole town onto higher ground - is projected to happen in other places as the effects of climate change get more severe. PINTER: We have trends towards spiraling flood damages over time. HERSHER: Pinter's first step as a researcher is pretty basic - count all the buildings in New and Old Odanah and make a map. PINTER: So do you have to put in a numerical value into the field? JAMES REES: I changed it to decimals. HERSHER: His student, James Rees, is helping. REES: First-floor elevation. So we just estimate that. Like, 2 feet maybe here. HERSHER: Every foot matters when it comes to flooding. In 2016, a huge rainstorm put Old Odanah under 8 feet or more of water. Luckily, almost everyone had already moved by then. Pinter and Rees will use this new map to estimate how much money that saved. PINTER: I don't want to tell them what their narrative is. But from an outside perspective, you had a relocation very well-timed ahead. It's usually right after the major flood. Here the real monster in terms of quantity of water came through after the relocation. HERSHER: Basically he says Odanah's relocation is a success story. The town got out ahead of climate change and saved itself. Other flood-prone towns can learn from that. But that's not how it feels to some people here. 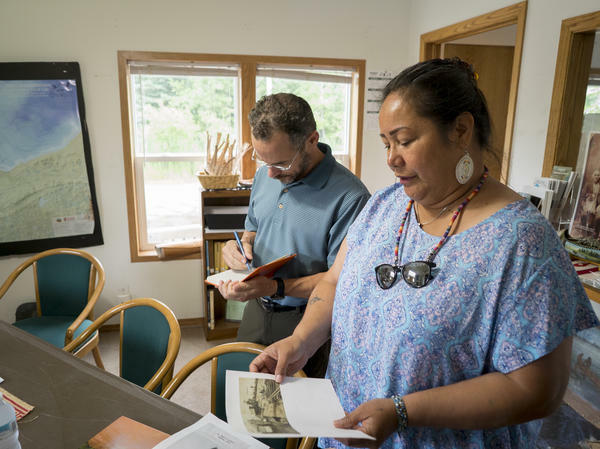 Tribal historian Edith Leoso flips through photos of Old Odanah at her office. EDITH LEOSO: OK. So here's a photo of Morrison's clothing store, Odanah Opera House. HERSHER: Today those buildings are gone. It's all forest. Leoso says it's important to understand how the relocation felt to some people in town. It starts with the long history of the U.S. government forcing American Indians to leave their land even in the recent past. LEOSO: I'm a product of relocation era - the Indian Relocation Act. HERSHER: Leoso and her family were among the thousands of people pushed to leave reservations and move to cities in the '50s and '60s. Entire tribes dissolved. She sees the federally assisted move from Old to New Odanah as the latest insult to her culture. LEOSO: It's just being forced to move. That's what - it's a - it was a forced relocation essentially. It wasn't something that we wanted to do. HERSHER: Pinter, the scientist, says the side-by-side economic success and apparent cultural failure of the Odanah relocation is a wake-up call for the federal government. Native communities are disproportionately affected by climate-related flooding in part because of that very same history of pushing native peoples onto marginal land. Right now the federal government is working on plans to move native towns in Alaska, Louisiana and elsewhere. PINTER: So we've learned the last couple days there are unique challenges in a Native American community. And given that some of the headline relocation sites are Native American communities right now, they absolutely should be visiting Odanah and talking to the people here. HERSHER: And scientists have a lot to learn from Odanah as well. Pinter says there's currently no good record of American towns and neighborhoods that have relocated out of flood plains. He says the state government didn't even know that Odanah had relocated, let alone why. He argues this is a moment for researchers to get serious about studying places like this. PINTER: The U.S. is right now spending tens of millions and may in the future be spending hundreds of millions of dollars on community relocation. They should be looking to the lessons of history and not letting important chapters in that whole history like Odanah just disappear. HERSHER: Pinter plans to publish the results of his study in the coming months. Rebecca Hersher, NPR News. (SOUNDBITE OF BEN SOLLEE'S "THE BIG OCEAN") Transcript provided by NPR, Copyright NPR.